Green and Healthy Landscapes Requires the Proper Fertilization and Disease/Insect Control Services. Choose GreenCorps, our horticultural management division, to protect your landscape investment from insects and other diseases and maintain it’s natural beauty through proper fertilization techniques. Our certified agronomist handles residential and commercial properties all across the bay area. 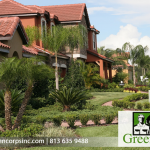 We pride ourselves in the fact that our highly trained technicians always follow Green Industry Best Practices while maintaining the integrity of the natural environment around your home or business. Click for a free assessment of your property or to learn more about GreenCorps. Sunrise Landscape is our design and installation division, responsible for handling all of our commercial and residential projects. Our skilled landscape designers can create unique layouts for each project. Copyright © 2019 · Sunrise Landscaping Contractors, Inc. · Website Design by SchranTech Solutions with Creative Web Actions.